FOR NEARLY THREE DECADES, The Nature Conservancy’s home in Maine has been leased space in the Fort Andross mill complex along the shores of the Androscoggin River. In the fall of 2016, Conservancy staff conducted an extensive review of options to lease or build new office space in the greater Brunswick area. In the end, the Conservancy determined that the best option was continuing to lease in Fort Andross, but with significant updates. A centerpiece of the ultimate design was a commitment to wood, because its use is good for the environment and the local economy. The construction materials included yellow birch walls and maple flooring sustainably harvested from the Conservancy’s own certified forest property in the Upper St. John River valley. The work also included new and old solid wood timbers. The Nature Conservancy is not alone in this effort. One of the best uses of wood is in construction—where it has long been commonplace in residential buildings across the U.S. In recent years, there have been some big advances in wood technology. Innovation in wood products could change the way we build commercial buildings and grow the demand for wood as a building material. One example is mass timber. This includes products such as cross-laminated timbers (CLT), which are wood panels typically consisting of three, five, or seven layers of framing lumber—such as two by fours—oriented at right angles to one another and then glued to form structural panels with exceptional strength, dimensional stability, and rigidity. CLT can now be made to be stronger than steel and fire resistant, while also reducing the lifetime carbon footprint of a building by 40 percent. 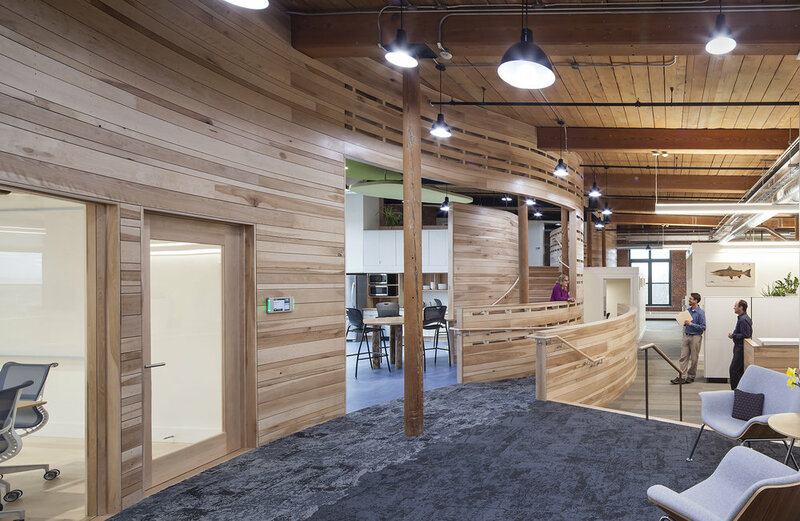 Technologies like CLT offer the potential for timber to be used in more than just residential buildings, expanding into the mid-rise and commercial building markets. Wooden skyscrapers are starting to pop up around the globe, with the tallest wooden building in the world (80 stories) set to make its debut in London. Maine has an opportunity to be a leader in CLT production because of our access to sustainably managed working forests, proximity to population centers in the East and our strong tradition of forest-dependent communities. Not only would this lead to job growth, particularly in rural parts of the state, and invigorate our forest products industry, but investment in CLT production would help diversify the state’s forest products industry. A diverse forest products economy helps maintain incentives for landowners to invest in long-term forest stewardship, keeping forests as forests. CLT has conservation benefits, too, by reducing carbon emissions. How do trees reduce carbon emissions? When a tree grows it takes carbon dioxide out of the atmosphere. It ends up in wood, which is about 50 percent carbon and 25 percent oxygen. By using the lumber in a building, you’re sequestering that carbon. Mass timber buildings also take far less carbon to produce than steel and concrete construction, which is inherently energy-intensive. Rapid marketplace changes have led to the recent closure of six pulp and paper mills and two biomass electric facilities in Maine. The result is that Maine has lost 50 percent of its softwood pulp market in the last two years. Bringing innovation and developing new markets is critical to building our forest-related industry and filling that softwood gap. Recently, Maine Senators Susan Collins and Angus King co-sponsored the Timber Innovation Act, a bipartisan piece of legislation that creates incentives for investment to conduct research and development of new methods for the construction of wood buildings. The proposal also supports ongoing efforts at the United States Department of Agriculture to further support the use of wood products as a building material for tall buildings. The bill’s introduction in Washington comes as timber “plyscrapers” are sprouting up across Europe, and as the era of U.S. plyscrapers begins in Oregon with the permitting of a 12-story structure in Portland. As this trend continues to grow, Maine is well-positioned to be a leader in long-lived wood construction alternatives. This move is not only good for our economy, but a strong contributor to reducing the impacts of climate change. Thomas Abello is the director of external affairs for The Nature Conservancy. 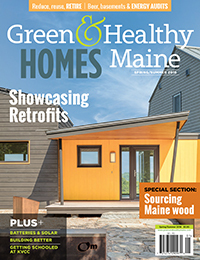 This article was reprinted from a special section on local wood products in the spring 2018 issue of Green & Healthy Maine Homes. Subscribe today!